Stetron’s engineering team is capable of developing enclosure solutions of various types such as ported, sealed, and passive radiator builds for audio sub-assembly. Software simulations and rapid prototyping using 3D printers and CNC machines are utilized to quickly develop a proof of concept design that meets every audio requirement. To optimize all manufacturing functions, we conduct a full DFM review before transitioning into production. Our agile approach to product development and manufacturing assures that our clients receive the best cost at the quickest turnaround. Contact Us to review your specific requirements. What is a Loudspeaker Enclosure? Loudspeaker enclosures play an important part in any audio system. There are many things to consider when designing a loudspeaker enclosure, other than the loudspeaker driver itself. For example, should the enclosure be sealed, ported or is a leaky enclosure acceptable? The common types of enclosures are sealed, ported and leaky. The sealed or closed box enclosure (Fig. 1) is perhaps the most common type and is one where the loudspeaker is mounted to one surface of the enclosure. At some location in the box a slow air leak is introduced to prevent changes in atmospheric pressure from displacing the neutral position of the diaphragm. Basically a ported enclosure is a sealed enclosure but with a port. Typically the area of the port is less than or equal to the effective area of the diaphragm of the loudspeaker. Fig. 2 shows a simple ported enclosure. The ported enclosure would necessarily have two resonances, one due to the loudspeaker and one due to the port/acoustic cavity. 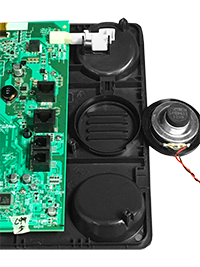 A leaky enclosure behaves like a ported enclosure, but with substantially more port resistance when considering the equivalent electro-acoustic circuit. A type of leaky enclosure is shown in Fig. 3 and as can be seen the loudspeaker would not be in its own sealed or ported acoustic cavity or enclosure. In other words such enclosure can be formed by the two halves of the product rather than a dedicated enclosure. So which of these three types of enclosures is preferred? Well, that depends on the designers’ goal. 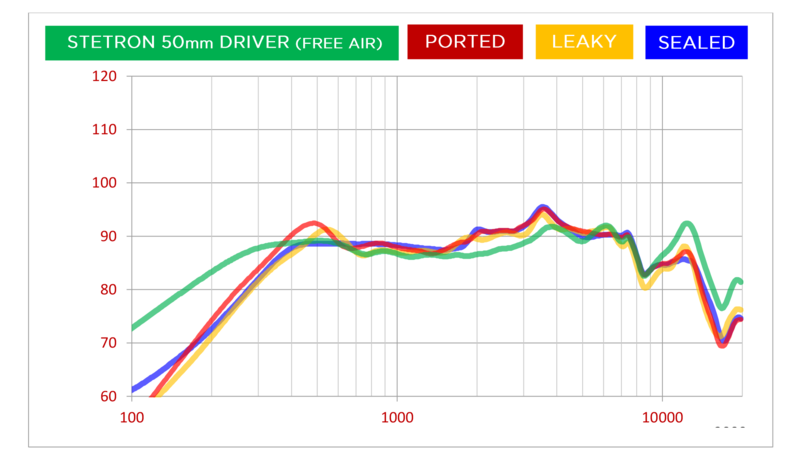 An experiment conducted by Stetron’s engineers on site shows the frequency response of the same 50mm driver in each of these three types of enclosures. Please see fig. 4 below. It is clear from the experiment that for the exact same 50 mm loudspeaker driver, depending on the enclosure used the frequency response will be different. If the desired goal is to have a flatter frequency response the experiment shows sealed enclosure would be preferred. If the acoustic engineer needs to have enhanced bass extension the experiment shows the ported enclosure will satisfy this requirement. As with anything engineering, there are also trade-offs to using a certain type of loudspeaker enclosure. We summarize some of the pros and cons below. Since the type of enclosure impacts the performance of the acoustic system, Stetron’s engineers are available to guide you through the process of determining loudspeaker enclosure type.